Spello, Umbria, Italy â€¢ Chronicling the creation and pursuit of a dreamâ€”living a year in the beautiful center. Where there is joy, love, and pasta. Lots and lots of pasta. Spello, Again 3 years ago It was coming home. The feeling leading up to the trip, the anticipation on the plane, the thrill of joy when we clamored out of the Fiat and soaked in the churchbells, the leaping of my heart when I caught sight of Paola waiting in the street outside Bar Bonci. Parent Thyself 5 years ago I spend a vast proportion of my day guiding my children towards a Beautiful Center. I only now realize how much I should listen to my own admonishments. Parent thyself, indeed. Just Love 5 years ago It's different here. Adults don't look to connect with my children. Adults don't look to connect with anyone's children that aren't related. Instead, other people's children are often measuring sticks to hold up to our own. 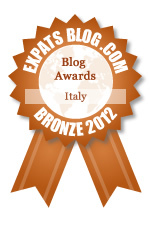 ExpatsBlog.com Expat Blog Awards 2012: Italy Bronze Award! This blog won the Bronze Award for best expat blog in Italy! I love this blog! Having been to Italy and always wanted to live overseas, it offers a wonderful view into life overseas. I can eat fresh Italian food, learn the language, and travel...vicariously, of course. It's my daily Italian fix. A beautiful and evocative blog that just keeps me coming back from more. Lyrical writing, gorgeous photographs, and a terrific ability to evoke not only a sense of "place", but also a sense of self for the author and her family. Really exceptional. Michelle writes beautiful descriptions of all she is experiencing. Everything is so vivid: I smell the food, feel the emotions, and see the beauty as if I were physically there with her. Every time I read this blog I feel like I've been to Italy! I also love trying out her recipes. "il bel centro" blog is so bright and witty. It is so interesting to follow Michelle and her family's immersion into the life of Spello for a year. By reading this blog one can become an armchair traveler and experience all of the joy, the discovery, the authentic life that can be experienced in a small town perched in Umbria. Michelle writes with such grace and style that I recommend this blog to anyone who has ever dreamed of living in Italy!! To be brave and passionate enough to live a dream is the greatest achievement in life. Bravissimo! I had just finished reading a great book and was on the hunt for a great read! That's how I came to fall in love with this blog! It's the highlight of my evening, putting my kids to sleep catching up with the latest in Italy! Not only is it a great story line, I'm getting some wonderful recipes! This blog should come with a warning just to make clear that reading it will make you want to sell your house, pack up, and move to Italy. It gives the reader such a feel for daily life in the lovely town of Spello--how it sounds, how it tastes, and its distinctive rhythm. Beautifully done and I gleefully look forward to new installments to see what the Damianis will be up to next. Capturing the uniqueness of a foreign place, Michele's blog offers a cultural treat. Her vivid descriptions of food, activities and people make me feel like I am there and eagerly anticipating the next writing. This excellent blog is so evocative of village life in Italy. It tackles expat issues with a beautiful narrative style and sensitivity to the local culture. A must read! Il bel centro is by far the best blog about a family living and loving italy. So many great anecdotes of how the kids are adjusting and a wonderful review of this great little town and surrounding areas. I look forward to reading this every morning. I feel like I know this family and they are good friends. The range of topics Michelle covers in her blog are wonderful. I learn something about the mysteries of parenting, the complexities of Italian food, and the challenges of travel every time I read her blog. This blog it's lovely: describe the details of living in a wonderful little center where people are gentle and simple. Spello it is described very very well. Compliments! Love reading this blog. Michelle is so honest about all the ups and downs, and describes the luscious details beautifully. Spello sounds like a remarkably friendly, homey place. This blog is full of exceptional writing about real feelings on everything from parenting to cooking to travel to occasional homesickness. It's fiercely genuine and engaging. I am in awe of how she captures the varied aspects of life adjustment and enjoyment in every entry. This blog is a find. A gorgeous combination of humor, education, and insight. Il bel centro carries me away into a world of adventure and growth. I feel as though I'm right there with them, experiencing that charming village in Italy in the most wonderful way possible. A completely credible and engaging account of an expat mom and her family. It is said that scenery in writing is not so much to create a pictoral, visually enticing picture but more so to create a feeling of the place. Michelle not only makes the reader feel as if they too are experiencing Italy as a new albeit temporary home, but more importantly to evoke an appreciation that life in and of itself is temporary... her writing begs you to breathe deep, explore, live life, make mistakes, fumble around, practice gratitude, and never ever cease to wonder. And to love fiercely. Absolutely engaging. I like to indulge in Michelle's blog with a glass of red wine and an hour to spare, as I get lost in it every time. I love this blog! It reads like a delicious novel and with the heart of a truly wonderful family. Can't wait for the novel!! I love this blog! It's the first one I turn to in my AM blog reading. The author has a great way with words, and an open, engaging style of writing that makes you feel like you are in the adventure with her. Having visited her Italian town, I love to picture the going-ons of her family. I highly recommend it! Michelle, I love love love your blog...I can totally see it on the book shelf of Barnes & Nobles Bestsellers..why not? Shades of (while very different from) A Year In Provence). With its beautiful photographs, delicious recipes and evocative writing, Il Bel Centro is a treat for the senses. And I challenge anyone reading this blog not to fall in love with Michelle and her family, let alone Italy. A beautifully written and honest blog. The stories of the struggles and triumphs the family has during their time in Italy - it's fabulous! Michelle's love for her family sets her words aglow like sunlight on morning mist. It is lovely to behold. Love this. would love to chat with Michelle with a few questions. Looking to do the same. Michelle, are you still around?